Welcome Micheal, We can help you. Thank You Fellow Members! I ve started the process of getting the front end conversion "Pre Production" going by researching everything about the GT 500 Front End Conversion, but have come up with some questions you all might be able to help me answer. Has anyone tried some of the places that Ive seen mentioned in this forum like CJ Pony parts or dagostino racing? I was going with North American Tunning but could never get through to talk to a human being. plus they were a bit pricey. And I have had bad expierence with E-Bay to trust that way with such a large price tag attached to the conversion. I ve been working with a local ford dealer and the price is around the same as the secondary market. That way I know I can t get screwed If anything is damaged, and theres no shipping fee. I also heard that silverstate ford parts carries what I need also. Your feedback is greatly appreciated! Another thing is, can the bolts and nuts and pins and whatever else is holding my GT bumper on, can be transfered over to the GT 500 conversion. Everywhere you look it always says "HARDWARE" I know about the brackets and reinforcements and sight shield, lower deflector, etc. but what about anything that requires a tool and some turning with your wrist. I ve read that alot of the "HARDWARE" can be purchased at Home Depot. but I don t want to waist cash on unnecessary parts. Hi, don't go with North American Tunning, I can never get someone to answer too. When I get home, I will send you a list of all the parts with the part numbers too. A Ford dealer would be the best place, that way you can check the parts out first before you take them home, that what I did. Most of the front pats will not interchange, again, I will send you a full detail sheet of the parts you need. Thank You Ted. I would just need a list of bolts, nuts , pins and/or whatever else holds the whole thing on to the front of the car. I have a list of the parts and parts number for the basics like the lower valence, lights, grills, etc. The dealership told me this morning that when I take it to the body shop to get it painted and installed, they have alot of "HARDWARE" on hand, but I don t want to get charged extra. Oh, one thing I couldn t find that had the dealer stumped, was the wireing harness for the fog lights. And do I need two of them? I heard also that the wires could be spliced together and a wireing harness isn t needed. It gets mind boggling!!! Get it painted and install it yourself. Not hard to do it. I did all the work on mine myself. If your car is a GT, then you can splice your existing fog light harness into the GT500 fog lights. All you need are the GT500 fog light pigtails (connectors that plug into the housing). I'm with krkitt1, I did all the work myself....it's pretty straight forward. Rivets, 4- Diameter 3/16", Grip 1/4" (ther's an official Ford part number but I chose to purchase some at the hardware store. I hope this helps you. If you need any more info, just let me know or email me. Is there anyone who makes an overlay of the Knight Research Cobra for the gas cap on the trunklid? Thank You All for your imput. It is greatly appreciated! Another question, how far should the racing stripes that go down the center of the Mustang be apart from each other. I heard standard is two inches but Im not 100% convinced of that. Is there also a place online that sells these racing stripes to fit the Mustang/KITT replicas, or are they special order? The cost around town here whereI live are a bit up there in price. Here's a picture of the rear Shelby SuperSnakes mounted on BF Goodrich 275/35R20. I also just got the centercaps from Shelby!! Wow! That looks fantastic Ted! I can't wait to see the centercaps on them. Very impressive Taoworm! Especially the HUD, can't wait to see it installed! Does anyone have the scoop opening dimensions for the Trufiber Venom hood? Specifically, the width of each hole, the height and the width of the piece in between them? krkitt1, thanks for posting the parts list for the nose. I just ordered it today! I almost had a TruCarbon Venom hood instead, but the guy raised the price by $300 while I was on the phone with him. I also started ordering an amber scanner for the hood that I thought I had which is why I need the measurements if anyone can help. 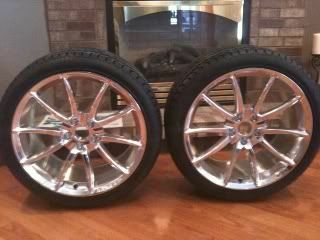 Well, I got the last rim today and the tires should be here Friday. Going to finish the dash lights replacement and work on the hood this weekend. I will get you the me measurements on Thursday for you on the hood, remember that the hood opening can be different on each hood. With the rims costing $500 each,it took me about 6 months to get them. Well things happen for a reason. When I first install the under the dash pad lights, they were too bright. Then after 4 months they started to go out one light at a time. Taoworm sent me a link for some new ones, so I ordered them and today I finished installing the new ones. Here's what I learned by doing this 2 times. The first time I mounted the lights right over the opening and this caused the light to be too bright and also you could see the lights reflexing on the dash (not good). This time I took what Matt did with his scanner, by setting the light back some, I got more of a blue glow and not as bright of a light threw the lense. This looks so cool now and also I can drive at night with them on and not needing a dimmer. Here's the best part. My first set of lights cost me $70.00 shipped. They had a years warr. but started going out after 4 months, the person I got them from would not replace them but did want to sell me a better set for $70.00 shipped. The lights the Taoworm hooked me up with cost me.........$12.00 shipped! They are 100 times better than the first ones and if they last longer than 4 months, than I'm ahead. Thanks Taoworm for the link and Matt for the idea. Can't wait for the scanner to get it going. I will post some new pictures of the dash later. I will have your scanner shipped out tomorrow as well. Can't wait to see new pictures of your dash!